This body mist will leave your skin feeling soft and not sticky. Make all one color or mix it up with 14 bottles of each color. Perfect for any special occasion. In a plastic beaker, mix 0.5 oz. Amber Romance Fragrance Oil with 0.25 oz. of the Vanilla Color Stabilizer. Let sit for 2 minutes. Blend in 2 oz. of the FO/EO Modifier. To a microwave-safe measuring cup, add 64 oz. of the Luxury Moisturizing Mist. Place in microwave and heat until warm, about 30-45 seconds. Add the entire fragrance oil mixture and gently stir. Add color as desired and mix. Fill bottles and let cool. Dip tubes will need to be trimmed before placing into bottles. Repeat above steps to make remaining body splash. To Use: Spray lightly onto skin as desired. 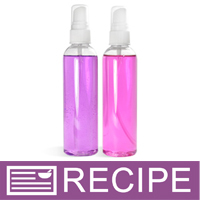 Ingredient Label: Water, Octoxynol-13, Nonoxynol-12, Propylene Glycol, Glycerin, Methylchloroisothiazolinone, Methylisothiazolinone, Fragrance, Red 33, Ext Violet 2. "Why is Vanilla Color Stabilizer used when there isn't a need to keep the color- colorless? " Staff Answer Since this fragrance contains vanilla, it will discolor and darken the product over time. If you choose not to use the stabilizer, you can certainly do that. "When I spray the mist I changed and used the ocean blue color and when I sprayed it , it stained the shirt I know it's for the body but why is it staining ???" Staff Answer This color is considered a dye and it will stain if sprayed or spilled on clothing. If you want to spray on clothes, we recommend not adding any color. But don't spray too close. The fragrance oil can stain clothing if sprayed too close to the material. It is meant to be lightly misted in the air or above bed linen, etc.